I certainly recommend to check a used car history records before buying a car. The good thing, Carfax works in Canada as well. Look at the picture I made at a body shop yard. Why do you think the body shop keeps that rear piece of the car? Because when they find the same vehicle with rear end damage, they will just weld one car from two pieces, paint it nicely and sell it through the auction somewhere in a different state or province. Soon it may appear in a used car dealer lot as "Immaculate condition with low mileage". 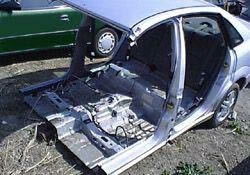 The car may look clean and shiny, but if you check the car history report, you may find that the vehicle was salvaged. Another example: Just recently I received a message from the person who recently bought privately a "low mileage" car. He even had it inspected by a dealer and had been told that the car is OK. Few days later he found out that Carfax report shows much higher previous mileage. Very unfortunate situation. By the way, when you bring the car to a dealer for inspection, have a look at items covered in the inspection checklist - usually it does not include things like previous accident check or odometer fraud check. Thus, even if you have a car inspected by a dealer, check history records BEFORE buying a car. How it works and how much it costs? All you need is the VIN (Vehicle Identification Number) of the car you are going to buy. 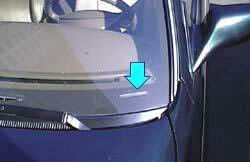 You can find this number in the vehicle title or under the car windshield (look at the picture). A single vehicle history report will cost you $19.99 (US dollars). Unlimited Reports Plan will cost $24.99 (It means that after signing up, you can run an unlimited number of vehicle history reports for 30 days from the date you run your first report). If you are in the process of shopping for a used car this plan will be better for you because you can check as many cars as you like for 30 days. I always use this plan. You can pay them online, they accept VISA, MasterCard, and American Express.